This was another brew day where one mash was used to produce two beers, though quite different from my farmhouse parti-gyle brew day. In this case, I made a 4-gallon batch of 1.045 OG where I drew off 2.5 gallons to ferment with the yeast & bacteria from my wild cider, then diluted the remainder to produce 2.5 gallons of low-OG saison fermented with White Labs’ 568 Belgian saison blend. The mash itself was a turbid mash with wort removed after the 125F rest, as well as shortly into the saccharification rest and boiled separately on the stove top. In the wild ale this will hopefully encourage a wider variety of organisms to flourish, while in the petite saison this will hopefully encourage a lower attenuation and more flavourful and full-bodied beer. The process, hopping, and fermentation are detailed below. Started the mash with only 7L of water in the Grainfather, 1L per pound grain. Even though this is slightly higher water ratio than typical of this style mash, due to the false bottom of the grain jacket sitting about 3″ above the bottom of the kettle there isn’t much water available to the grain. Strike temp 117F for dough-in. Started heating 4 gallons of 190F sparge water for various steps along the way. Added 0.75 tsp of both CaCl and Gypsum to this sparge water. Pulled 1.3L of milky wort after raising the temp to 125F and letting stand for about 20 minutes. Brought to 190F on the stove-top. Added about 2.5 gallons of 180F water to mash and set recirculation up with set temperature of 158F. Left 45 minutes. At the 15 minute mark, another ~0.8L of murky wort was pulled and brought near-boil on the stovetop. The remainder left to fully convert. Mash-out and sparge were performed at 175F. I didn’t want to go lambic-level hot on the sparge as the petite saison will be consumed young. Once boil was achieved I added about 0.3 oz of Willamette with 3.6% AA, for around 5 IBU of bittering. Pre-boil SG was 1.036. I pulled the Pomebic portion after 95 minutes of boiling via the counterflow chiller. OG on this was 1.045. The rest was then diluted with boiling water from the stove-top to a SG of 1.030 and hopped with 0.15 oz of Azacca and 0.55 oz of Willamette. 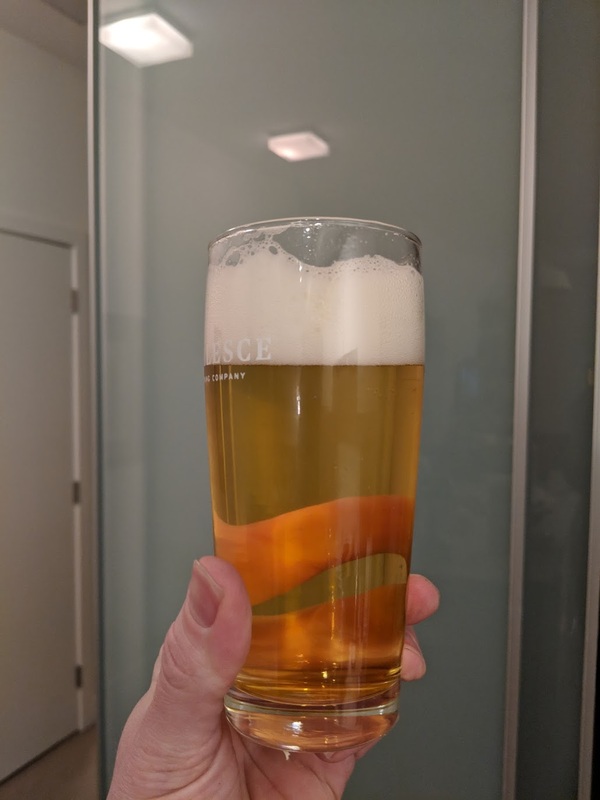 It was then boiled 30 minutes, then flame-out hopped with 0.75 oz Azacca and 1.00 oz Willamette and chilled into the Ss Brewtech 3.5 gallon fermentor. OG of the petite saison going into the fermentor was 1.035, a bit higher than target. Collected about 2.3 gallons, slightly under target volume. Fermentation: Wild apple yeasts, fermentation start 67F, free rise to 73F. US-05 added at day 5 due to no significant CO2 production. Dregs from Four Winds Pomona added at 2 wks. Dregs from Strange Fellows / Modern Times ‘Strange Times’ added at 4 wks after transfer to secondary & top-up with fresh saison wort. Pellicle formed around 8 wks. The beer was allowed to condition for 13 months before 800g of Orange Blossom honey was added. After an additional 6 or so months, it was bottled (Sept 9, 2018). At this time it had a nice acidity with mead-like and stone fruit flavours. Fermentation: WLP568, start at 65F free rise to 73F. Transferred to secondary with about 25% fresh 1.044 wort at 4 weeks and pitched with starter culture from SF/MT collab ‘Strange Times’. Jan 11, 2017 – Gravity sample on the petite saison. Two things surprised me: the beer is nearly crystal clear, and attenuation was not hindered by the turbid mash. 1.002 at present, or 94% AA. Well it was a good idea in theory, going to need to work on my process there. Also some rather pungent byproducts in the aroma right now – sulphur seems to be a component, but not everything. Has dissipated now as I write this. Flavour is quite pleasant, grainy and stone fruit with very limited phenols. Jan 18, 2017 – Still a prominent odour on the petite saison. Foot mixed with sulphur, or something. It does dissipate after a while and the flavour is nice once past that. The plan was to bottle this imminently but with these volatiles in there I am debating two options: transfer to glass and let it condition for longer (and maybe pitch some brett), or bottle it with a brett addition and hope that takes care of the phenols. 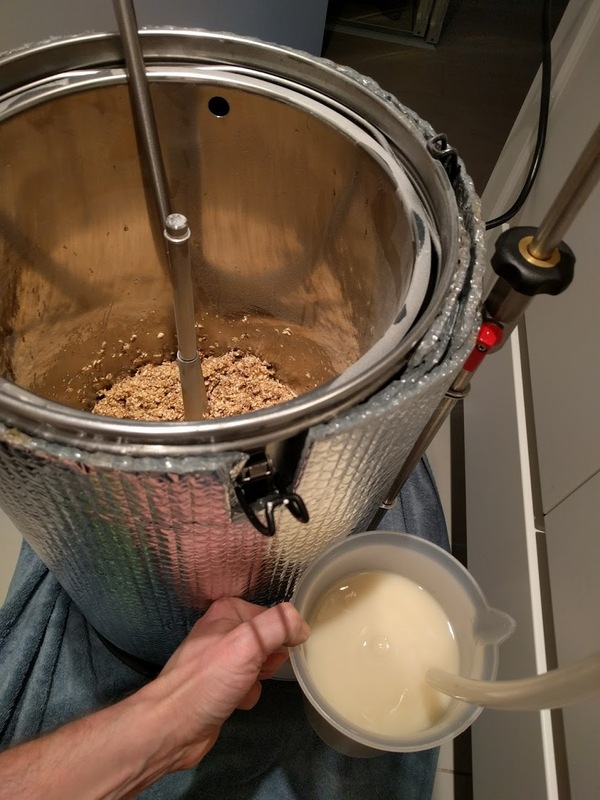 Jan 22, 2017 – Transferring Pommebic to secondary. Still at 1.010, fermented down with US-05. Very nectarine/peach forward fruitiness on the nose. Smells sour, but acidity on the palate is quite minimal at this point. Clean and fruity taste, could be good with time. Topping up with fresh wort from Saison Dorée brew day. Also, transferred petite saison to secondary where it will receive a mixed Brettanomyces pitch. Jan 26, 2017 – Pitched a healthy brett-forward starter during high activity which went to work almost immediately on each carboy. Steady bubbles (15-20 min) for a few days. Both carboys developed some krausen again after the top-ups after 2-3 days. 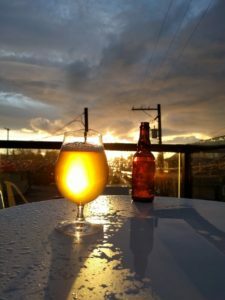 Mar 2, 2017 – Bottled the petite saison. Already showing plenty of character from the secondary pitch, and a pellicle was just starting to form before draining the carboy – sorry beer, but I need that carboy! Bottled at 1.003 with 2.0 oz sugar and 2.6 gallons bottled. Expecting that it might further attenuate over time, hence bottling at a slightly lower CO2 volume. Mar 22, 2017 – Drinking the first bottle of the petite saison. Strong apple skin character along with some stone fruit and funky hay. Pretty nice, a little overly cidery but quite drinkable stuff. June 6, 2017 – Petite Saison (PS30) is developing more of a lemon/apricot character which is pleasant. Carbonation is a little too low to support the low gravity, and thus it comes across a bit watery. Apple character is still there but more balanced now. June 27, 2017 – Primary pull on Pomebic. SG down to 1.006. Aroma is fruity sour candy, quite lovely. Taste is surprisingly funky given the lack of funk on the nose, similar to a funky cider. Not overly cidery otherwise. Lacks intensity overall but coming along nicely. Will check in a couple months to see if gravity has stabilized. Nov 26, 2018 – bottle of the Pomebic. Nearly two years since brew date but only a couple months in bottle, this opened with a burst of sulphur but dissipated very quickly, as did the head. After than the nose was pleasantly floral with a bit of underripe stone fruit. Tastes shows a little funkiness in there but overall it’s lightly acidic and floral. Feb 4, 2019 – Pomebic has seemingly broken down that sulphur issue with a little more time in bottle. Head retention was a bit better than the previous bottle (see above photo), though it did reduce to trace lacing after maybe 30 – 60 seconds. Bright acidity is on the high end but not out of balance, and it does have great floral complexity.